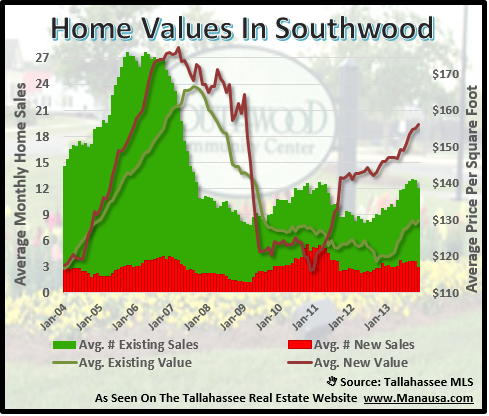 It is time to take a fresh look at home sales in Southwood, the most active neighborhood in Tallahassee over the past few years. 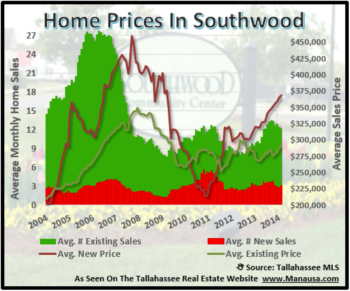 As it is the most active subdivision in Tallahassee, I consider it wise to keep a close eye on home sales in Southwood, knowing that changes here will often be reflective of the rest of the Tallahassee real estate market. 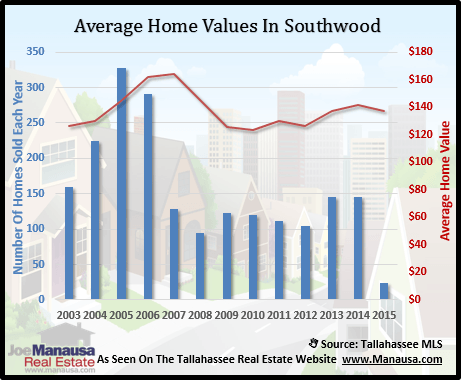 Currently, there are nearly 60 homes for sale in Southwood (up 25% since January) and hundreds more in the shadow inventory, so we expect home sales in Southwood to remain at or near the top of the list of most active neighborhoods in Tallahassee. 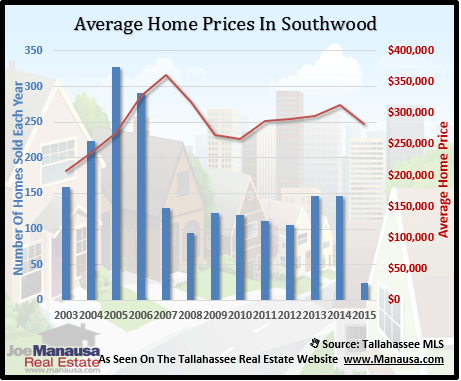 Average price measurements on home sales in Southwood are on the decline, just as we have seen everywhere else in the Tallahassee real estate market. Since this is merely a mid-March report, we’ll need more time before we can spot the real level of the trend. The real story around home sales in Southwood is all about depreciation, and the rate at which home values are dropping. Most reports from simple online algorithms and untrained real estate practitioners fail to understand the true nature of the supply and demand for real estate in Southwood. The two real estate graphs below are a case in point. 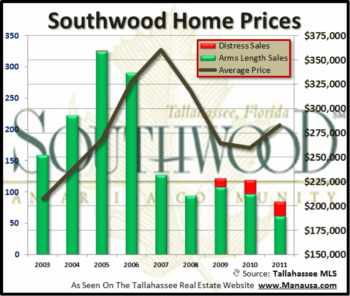 This first graph is easily assembled by looking at the average value of recorded home sales in Southwood. It looks at price per square foot over time and shows that last year, we started to see home values rise. This would be great news if it were true. In order to get an accurate view of depreciation among home sales in Southwood, we have to segregate new home construction from the resale market. As land values were slashed in Southwood to liquidate developer inventory, builders are able to bring new construction to the market at lower prices to compete with and edge-out current homeowners. When existing home sales and new home sales are measured separately, we are able to see the "real deal" in the Southwood real estate market. New construction values are in red, while existing home sale values are showing in blue. Existing home values have been on a steady decline since 2007, while an interesting trend has occurred with new home sales. See how the red line plummeted until 2010, and then the trend is rising. The downward trend was builders liquidating existing inventory with falling prices, the ensuing upward trend is new homes built to take advantage of the niche offered by lower land prices. This can only continue until land supply is exhausted or land values get reduced to nothing. If you want to see a list of recent homes sold in Southwood, just follow the link below. If you would like to know more about buying or selling a home in Southwood, just drop me a note and we can set up a time to discuss your specific situation.